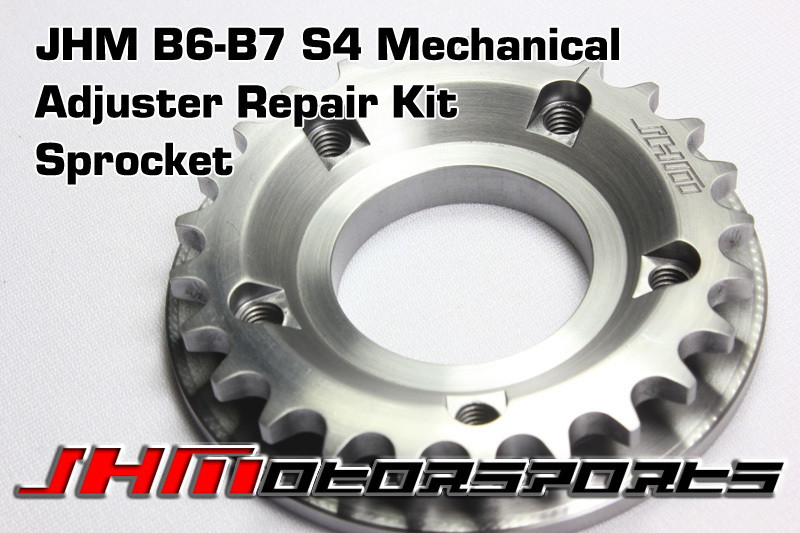 Introducing the JHM Mechanical Cam Adjuster Repair Kit! Another exclusive, cost effective repair solution for your B6-B7 S4 brought to you by the V8 specialists at JHMotorsports! Not only will our repair kit fix your bad mechanical adjusters, it costs half the price of OEM!!! (As of 5-15-2014, retail pricing was $1491.00 for two adjuster units). If that wasn't enough, our part is better than OEM and will prevent future premature wear issues. The 4.2L 40v V8 in the B6-B7 S4 (and some C5-A6 allroads), is notorious for having a failure prone timing chain system. 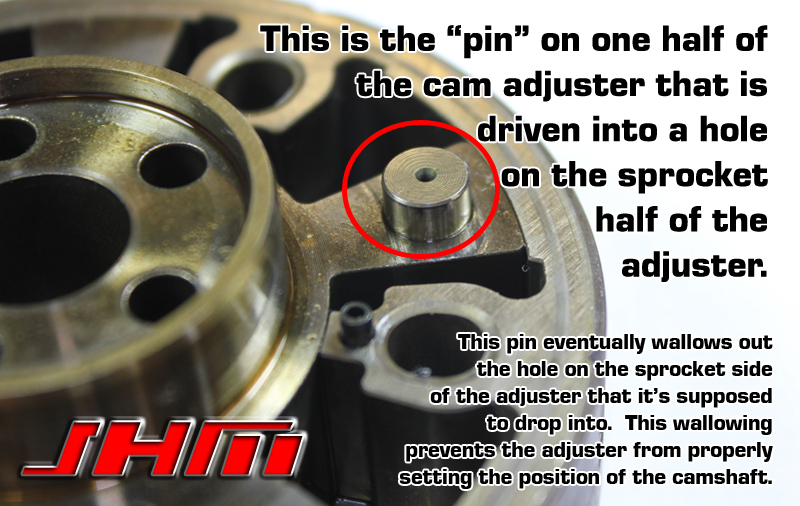 One of the most problematic pieces of this system is the mechanical cam adjuster. These adjusters are located on the end of each intake camshaft. This mechanical cam adjuster moves the cams to optimize the airflow into the combustion chambers either at idle and low speeds or for top end, high-rpm power. The mechanical cam adjuster is essentially a two piece unit but in true Audi fashion, you can't buy the pieces separately! One piece or side of the adjuster has a hardened pin on it (shown in the picture below). At lower RPM and idle that pin is driven into the hole located on the sprocket side of the adjuster - the part of the adjuster that we replace in our repair kit. This optimizes the camshaft profile for idle and low speed engine operation. At higher RPM, oil pressure is applied to the mechanical adjuster via the electric actuator to release the pin which retards the camshaft slightly to provide more top end power. The hole on the sprocket side of the adjuster begins to wallow out and the pin can no longer stay in the hole when it's supposed to. This has the effect of making the motor run like it would if you had a 'race cam' running at idle - you get a lot of misfires and low compression numbers on the bank or banks of the motor with the bad actuator. - 17755 - Camshaft Position Sensor 2 (G163) / Engine Speed Sensor (G28), P1347 - 001 - Incor. Correl. 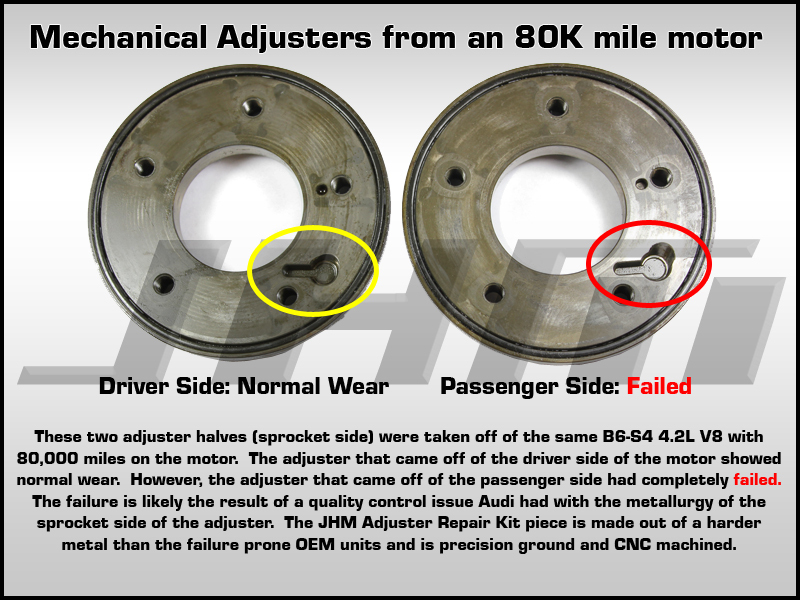 The failure of these adjusters shown above is the result of a quality control issue with Audi's tolerance range for the hardness of the metal used to make the sprocket side of the adjuster. As shown above, the tolerances can vary by so much that even the same car can have an adjuster on one side of the motor that's wearing normally while the other adjuster has completely failed. This is exactly what our JHM Mechanical Adjuster Repair Kit was designed to address. 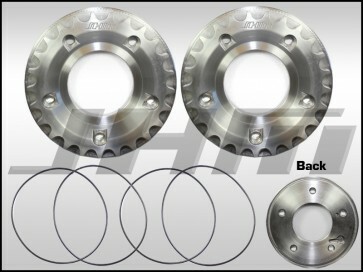 The JHM Mechanical Adjuster Sprocket is precision ground, CNC machined, and harder than the OEM unit it replaces. We've been testing our mechanical adjusters since early 2013 and the results have been great. They install just like the factory cam sprocket. 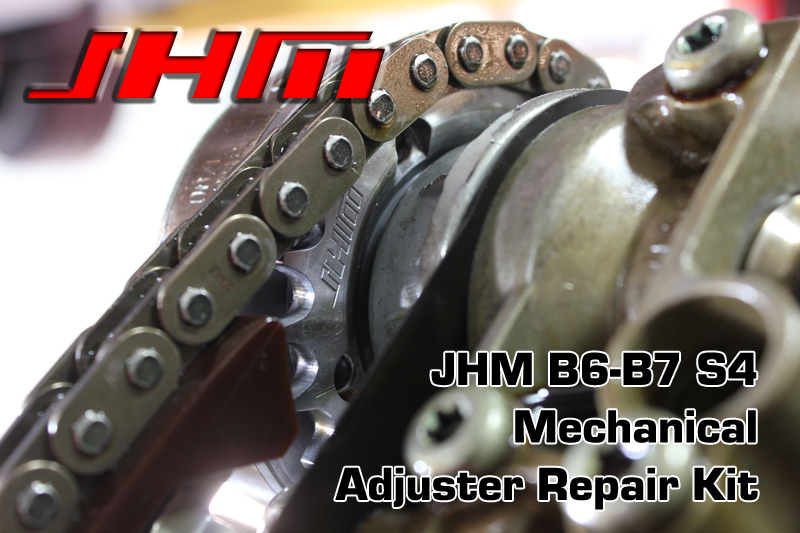 All you have to do is disassemble your OEM adjuster unit, discard the failed sprocket piece, replace it with the JHM precision ground and CNC machined unit, and re-assemble the adjuster! THIS PRODUCT IS FOR TWO REPAIR KITS!!! This is the product to buy if you're looking to repair both of the mechanical camshaft adjusters on one car. If you're looking to perform a complete Timing Chain service using our JHM Mechanical Adjuster Repair Kit, go back one section and select the correct level kit for your needs. JHM Mechanical Cam Adjuster Repair Kit fits OEM PNs 079 109 087 J, 097 109 087J, 079109087J, 079 109 087 L, 097 109 087L, 079109087L, 079 109 087 M, 097 109 087M, 079109087M, 079 109 087 N, 097 109 087N and 079109087N.